Anna Mae Burlingston was born on July 16, 1893 in Linwood, Wisconsin, the daughter of the Norwegian immigrant and farmer Gunder Huseland, who at the time went by the name Frank Burlingston, and his wife Amma Mabel Mason. Anna was one of seven children. The farm was located on an island in the Wisconsin River that was referred to as “Treasure Island” or “Burlingston Island.” In 1907 the family moved to Colville, Washington, and shortly thereafter, Anna’s father died. She and two of her sisters went to work as domestic servants in Spokane, Washington, to help support the family. She met the tattoo artist Charles “Red” Gibbons in Spokane; he was working in an arcade and had been tattooing professionally for a number of years. They married in Spokane in 1912; the couple had one daughter. After several years of marriage, Gibbons and her husband decided that they would make a better living if she became a performing tattooed lady, so Charles Gibbons tattooed Anna with images from her favorite classical religious artwork, in full color. Her performance name was Lady Artoria Gibbons – The Living Art Museum” Anna Gibbons was a deeply religious woman and a lifetime member of the Episcopalian Church. Her tattoos included illustrations of angels and saints as well as patriotic images, including George Washington. Her work also included drawings by Raphael and Michaelangelo. She debuted as a performer in 1921 with the locally-based Pete Kortes Sideshow. After two years, she worked for Ringling Bros Barnum & Bailey which would than evolved to countless circuses, dime museums, carnivals, and sideshows thereafter. Tattooed men and women have been a staple of the American sideshow since the mid-nineteenth century, Anna helped pave the way for tattooing as a source of legitimate income at a time when it wasn’t even considered a legitimate occupation. 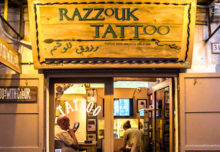 The first American tattooed man began working in the 1840’s, and tattooed women in the 1880’s. Artoria’s final steady gig was with Hall and Christ in the 70s. 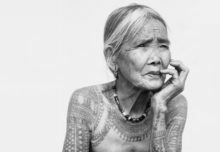 She officially retired in 1981 and passed away shortly after on March 18, 1985 forever idolized in the tattoo culture as one of the First Tattooed Lady’s in the country. In more recent news, in 2016, Lady Artoria’s daughter announced that she was planning on publishing a book about her parents tattooed love affair.